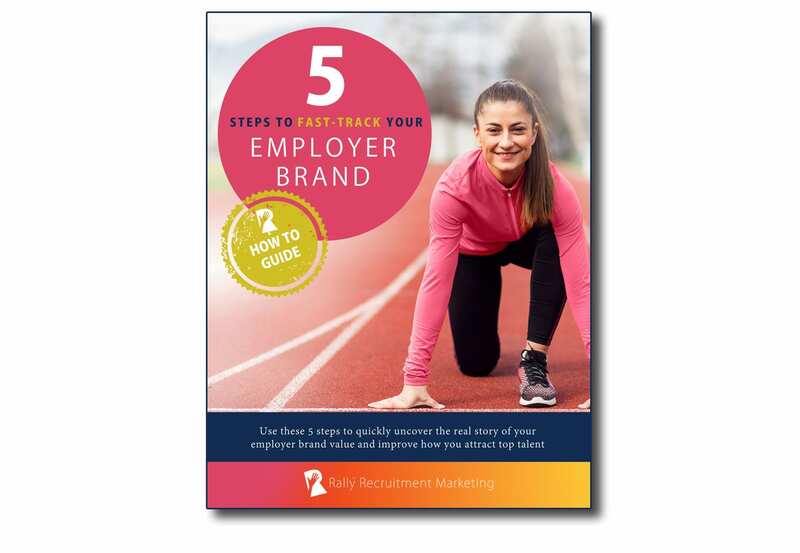 Quickly develop an authentic Employer Brand with our 5 step fast-track method. Packed with proven tips to create your value proposition from real employee stories, along with best practices to activate your employee brand ambassadors. Featuring inspiring examples from top employer branding practitioners, including Dina Medeiros, Laurie Brown, Colleen Finnegan, Tiffany Lee and Shelby Burghardt. As you develop your Employer Brand, you need to get it right, but you also need to move fast to stand out from the competition now. This Rally Guide shows you how. Employer branding can feel intimidating. But guess what? Your employer brand already exists! It’s the value proposition that you offer employees and candidates (what you say), and the reputation that your company has as an employer (what others say about you). We all know that it’s important to market our employer brands, not only advertise our jobs. But, how do we know if we’re communicating our employer brand value authentically? Where can we get real employee stories to inform the messaging of our employer brands? This Rally How To Guide, sponsored by The Muse, will show you our 5 step method to fast-track your employer brand by uncovering what your employees find valuable about working at your company. 1. Uncover – what your employer brand is with these methods to figure out what makes your company a great place to work. 2. Confirm – the insights you’ve gathered from your employees with leadership so that you can keep moving forward. 3. Create – the employee stories content that authentically conveys your employer brand value to candidates. 4. Communicate – your new messaging and employee stories consistently across all your recruiting channels. 5. Activate – your employee brand ambassadors to share your messaging with their networks and amplify your reach. With an agile way to uncover your employer brand story, you’ll be able to improve your Recruitment Marketing messaging and amplify your employer brand to better attract top talent. Download your copy of the Rally How To Guide today. Rally™ Recruitment Marketing is an online community forum where the best Recruitment Marketing ideas are learned and shared to educate and empower you to lead the future of talent acquisition. Rally with us at https://rallyrecruitmentmarketing.com. The Muse strives to make work more human by being a trusted resource for millions of people as they seek career satisfaction—not just another job. Companies partner with The Muse as they look to attract and retain the best talent by telling an authentic and compelling employer story. Our mission is to create meaningful connections between companies and candidates to make the world of work—from the job search to career development—more personal. Learn more at https://www.themuse.com/employers. The Muse is a sponsor of Rally. Their sponsorship fee helps us to create educational content and events on Recruitment Marketing.